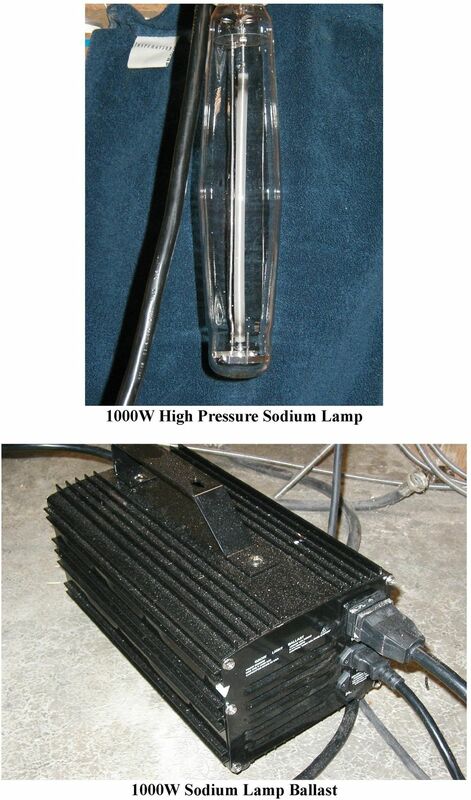 Study of RF Spectrum Emissions in High Pressure Sodium and Metal Halide Lamps. Lawrence P. Glaister VE7IT, Automation Engineer. Download "Study of RF Spectrum Emissions in High Pressure Sodium and Metal Halide Lamps. Lawrence P. Glaister VE7IT, Automation Engineer." 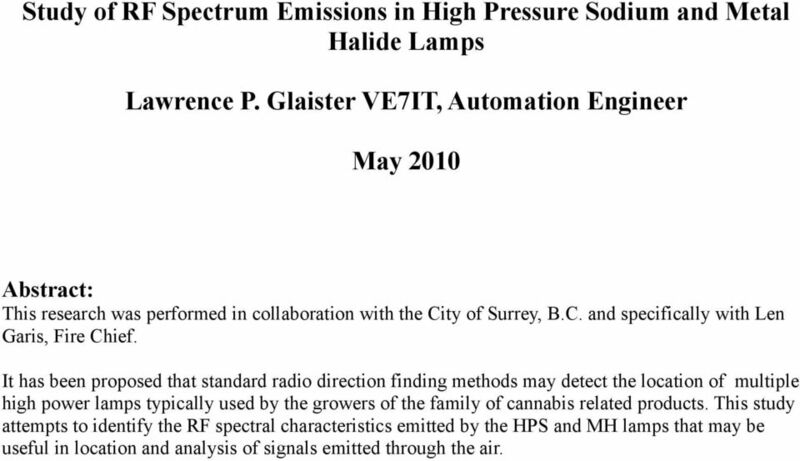 1 Study of RF Spectrum Emissions in High Pressure Sodium and Metal Halide Lamps Lawrence P. Glaister VE7IT, Automation Engineer May 2010 Abstract: This research was performed in collaboration with the City of Surrey, B.C. and specifically with Len Garis, Fire Chief. It has been proposed that standard radio direction finding methods may detect the location of multiple high power lamps typically used by the growers of the family of cannabis related products. This study attempts to identify the RF spectral characteristics emitted by the HPS and MH lamps that may be useful in location and analysis of signals emitted through the air. 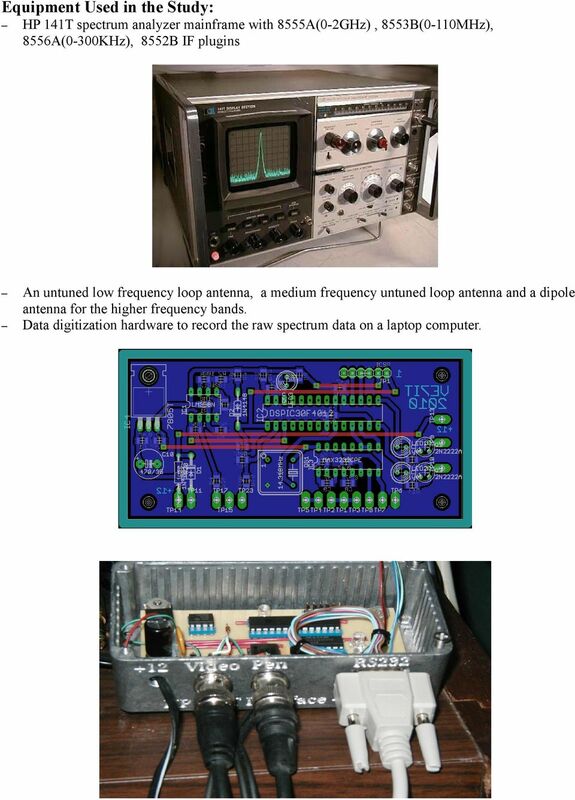 2 Equipment Used in the Study: HP 141T spectrum analyzer mainframe with 8555A(0-2GHz), 8553B(0-110MHz), 8556A(0-300KHz), 8552B IF plugins An untuned low frequency loop antenna, a medium frequency untuned loop antenna and a dipole antenna for the higher frequency bands. Data digitization hardware to record the raw spectrum data on a laptop computer. 5 Reference Antennas: Below 50Khz, antennas get very large. Because of this, the transmitting antenna (lamp wiring) is going to be a very poor radiator, and a receiving antenna will be very inefficient. Small loops should maintain directivity. Dipoles will have some directivity up to about twice the low frequency limit and then the pattern will split into multiple lobes and nulls. A this point in the project, we are using the antennas as general purpose detectors and not for direction finding. The loops are untuned and non resonant. This makes them less efficient, but gives us a broader frequency response. One would typically use a tuned loop when attempting to receive weak narrow band signals. 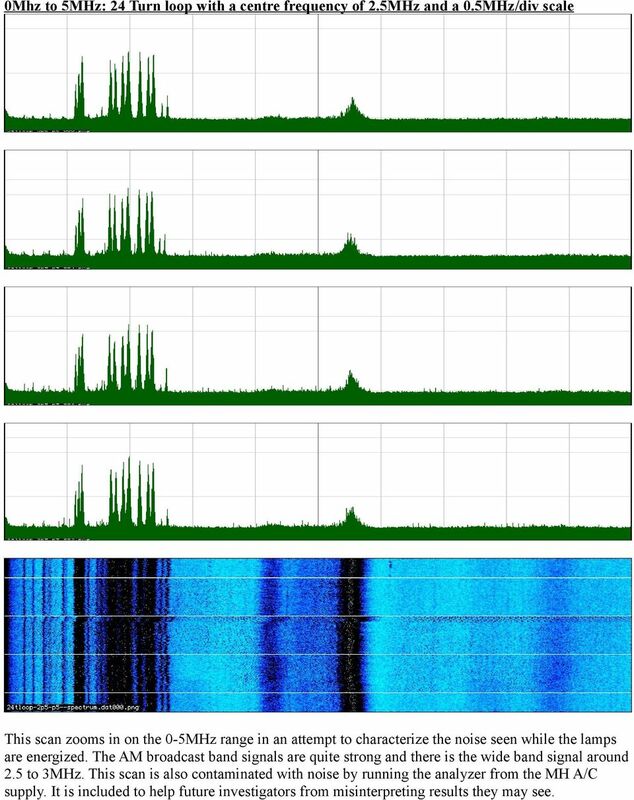 Tuned loops can have bandwidths as narrow as 10's of khz and would not be suitable for wideband spectral studies such as this one. Below is a brief description of the reference antennas constructed for use with the spectrum analyzer. 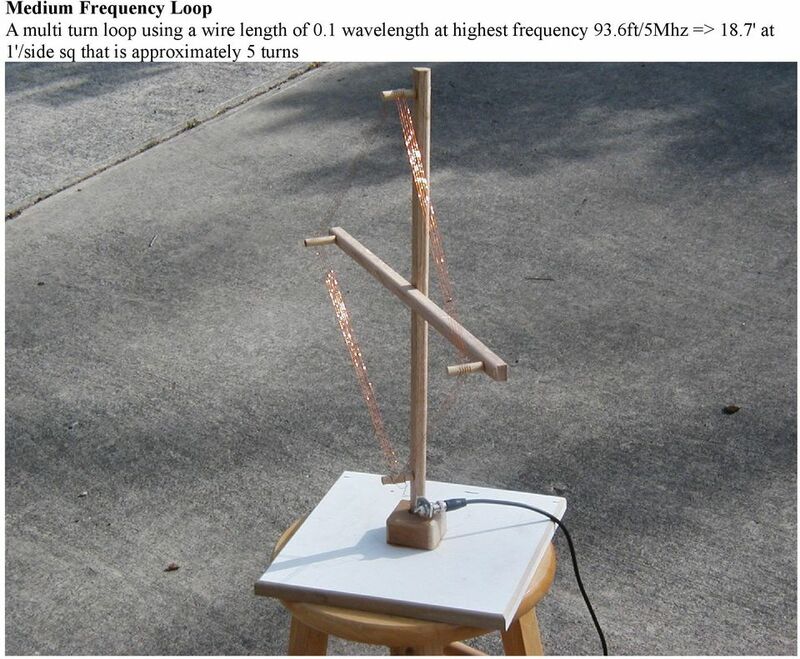 A Low Frequency Loop (0-5MHz) A multi turn loop using a wire length of 0.1 wavelength at highest frequency 93.6ft/0.5Mhz => 187' at 2'/side sq that is approximately 24 turns. The loop is quite effective from 0.5-5MHZ as well. 7 50Mhz to 700+Mhz T2FD Dipole See reference on t2fd antennas. T2fd antennas are folded dipoles that are resistively loaded. A 4' dipole should have good performance from about 70 to 700MHz. This antenna was constructed with 1/4 copper tubing. It is 44 tip to tip and is feed with a 300ohm to 75 ohm TV type balun. The terminating resistor is 390 ohms. As it turns out, the antenna shows a very good match to below 3MHz although its sensitivity is decreased in the HF region. 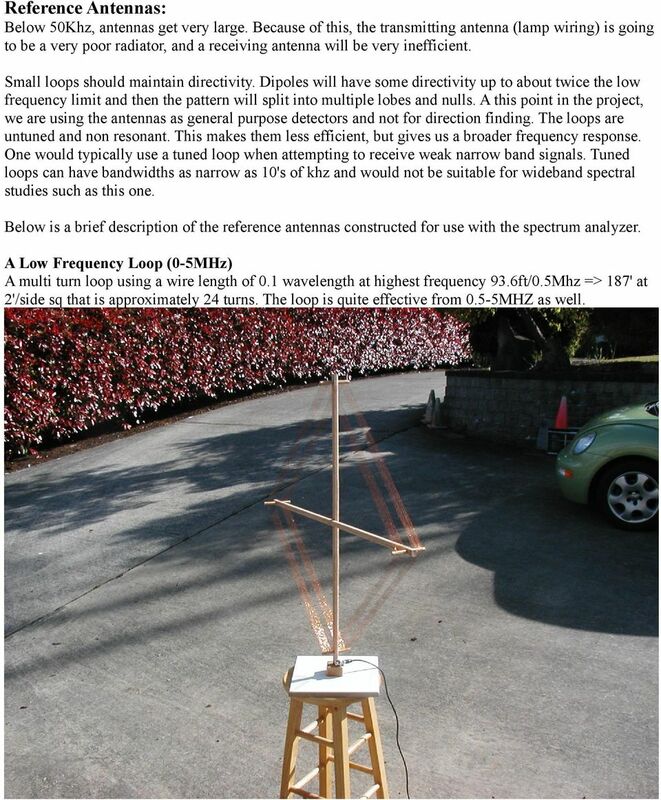 This is a very nice reference antenna for spectrum testing, but lacks the potential directivity of a loop antenna. 8 Background: Amateur radio operators have experienced severe radio interference from grow operations located within a several kilometre radius. The interference can be many times the signal strength being used for voice or data communications in the 80 meter or MHz amateur band. The interference sounds like a wide band hash with strong 60Hz overtones. This type of noise can be generated by many AC line powered devices such as brush type motors, SCR lamp dimmers, arc welders, street lamps, and faults in the electrical distribution system such as cracked line insulators. The noise tends to be very broad banded covering several Mhz and is best detected with wider bandwidth AM detectors due to its impulse type characteristics. The testing performed during the preparation of this report was to determine if MH and HPS lamps have any identifiable radio frequency emissions. 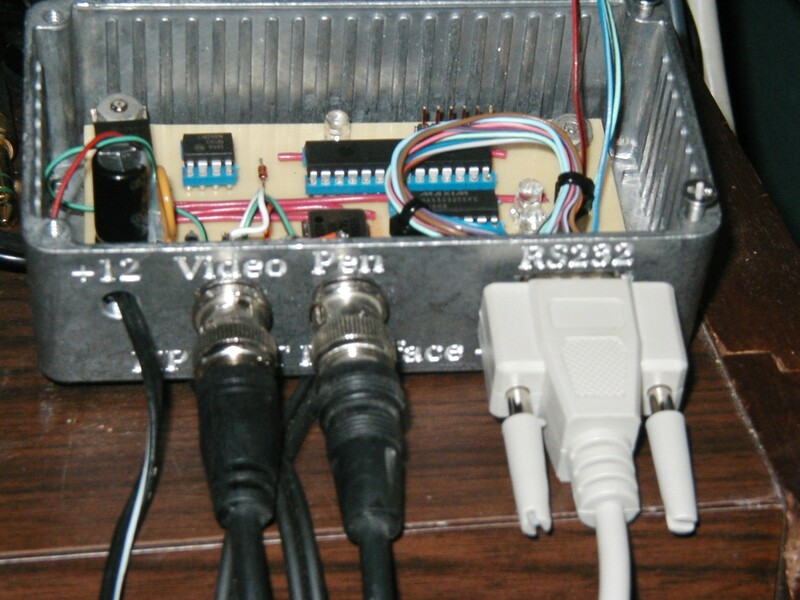 9 Procedure: A custom hardware interface was developed to interface with the RF spectrum analyzer to aid in the collection of multiple spectrum scans with a computer. The lamp characteristics change significantly during the several minute long warm up phase. The test procedure needed to monitor the lamp operation over a period of 10 to 15 minutes. Each spectrum is displayed as a line of colour coded information in a collection of scans known as a spectrogram. 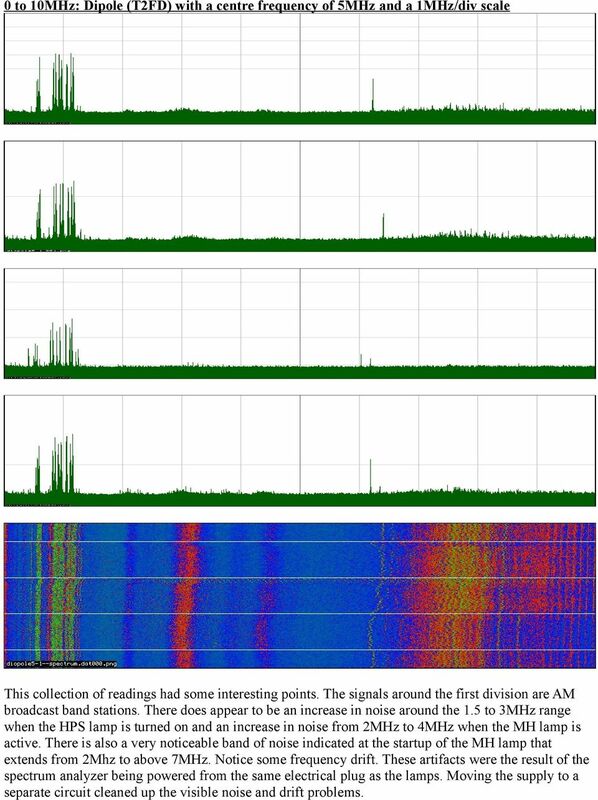 A spectrogram makes it very easy to identify signals that are changing frequency or amplitude over time. 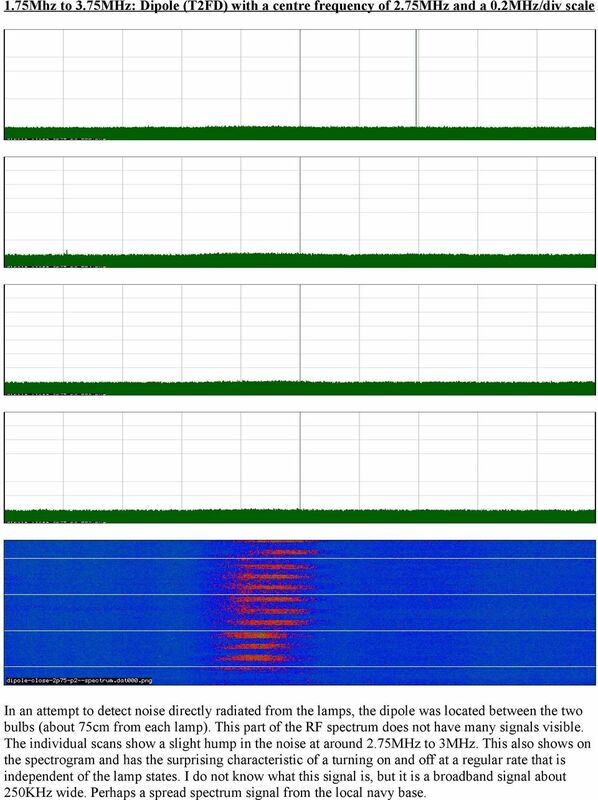 Because of limitations in the detector antennas, the frequency range of interest is broken up into segments with a spectrogram being collected for each segment. 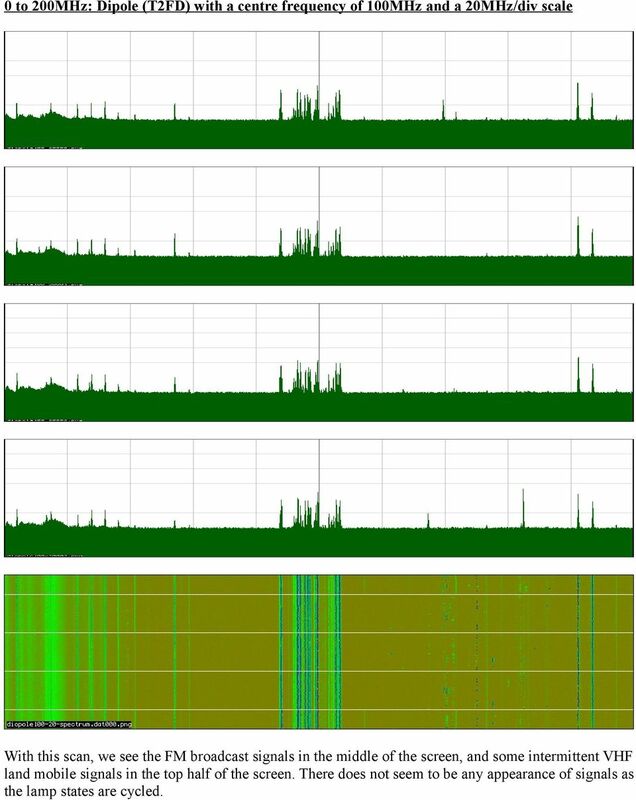 At each frequency range, multiple spectrum scans are performed. The lamps are allowed to operate for several minutes in each state as there is a noticeable difference in operation during the startup vs the warmed up and running phase. Each spectrogram consists of 5 states: measurement of background spectrum with no lamps energized HPS lamp energized and warmed up HPS and MH lamp energized and warmed up MH lamp only measurement of background spectrum Each spectrogram consists of approximately a quarter of a million measurements (1000 measurements/line by 246 lines) recorded over a period of about 20 minutes. 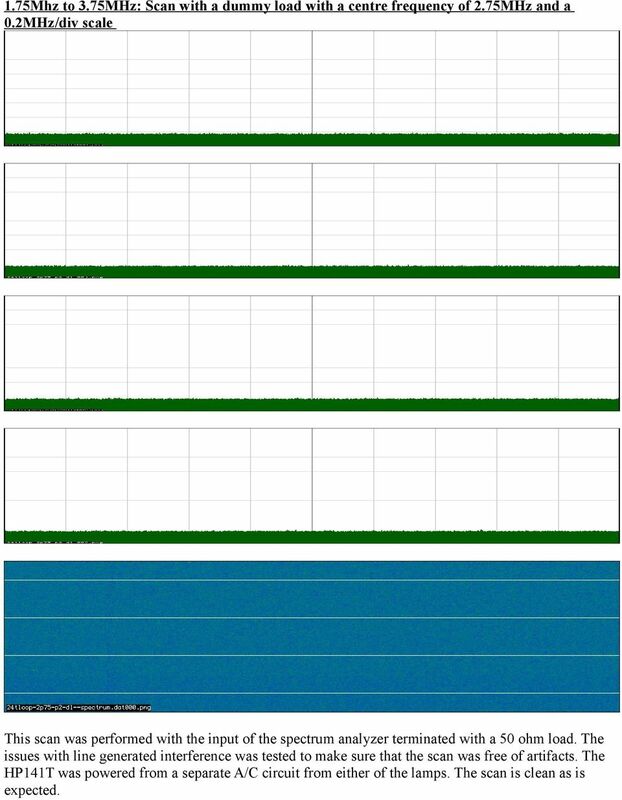 In the following pages of graphics, each page consists of measurements taken using a particular antenna and a particular range of settings on the spectrum analyzer. 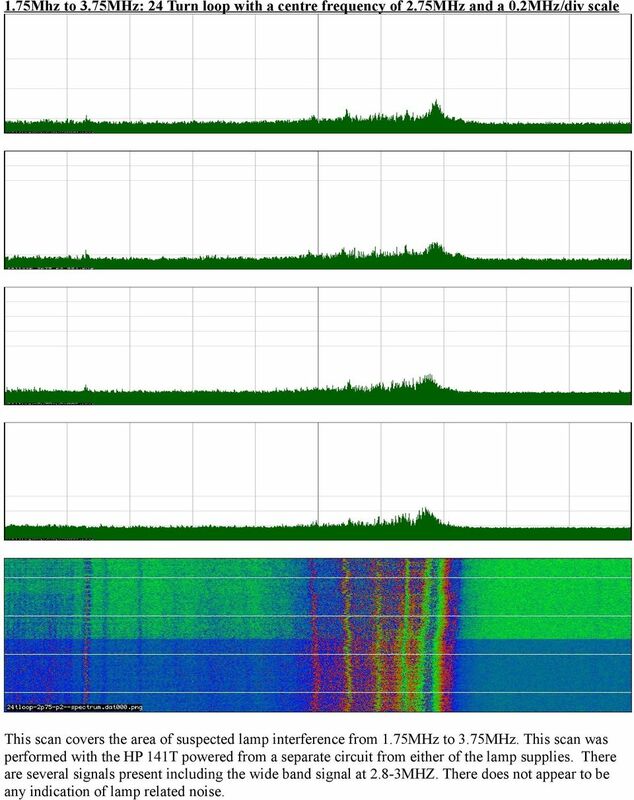 From top to bottom of the page, the scans consist of a spectrum scan of one of the lamp states listed above and the final graphic is a spectrogram collection of scans that is useful for detecting changes during lamp state cycling over a 20 minute period. For most of the tests, the antenna was located approximately 8 metres from the lamps in a clear area outside of the testing garage. One test was performed with the dipole antenna in close proximity to the bulbs. 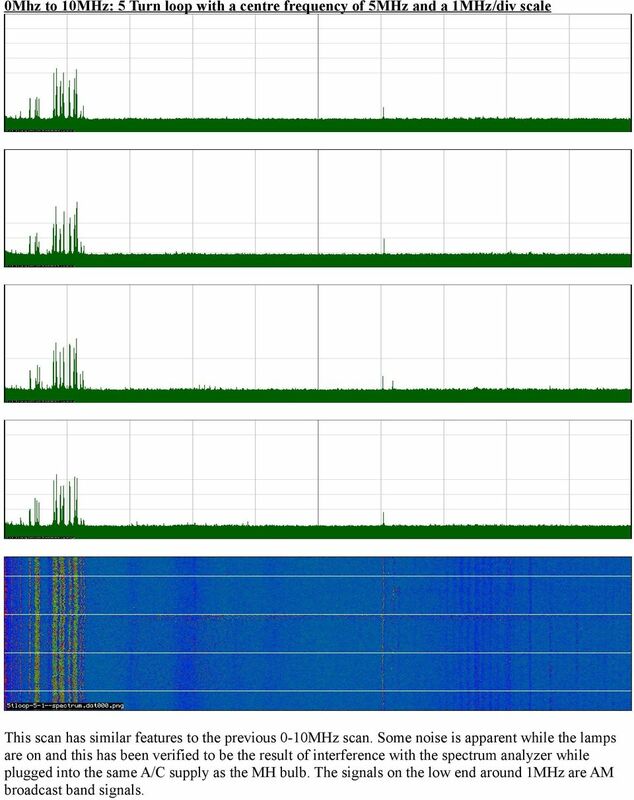 10 Results: 0 to 1000MHz: Dipole (T2FD) with a centre frequency of 500MHz and a 100MHz/div scale In this series of spectrum scans and a composite spectrogram, we see some signals in the HF region under 50MHz in the first division and some FM broadcast stations around 100MHz at the first division. 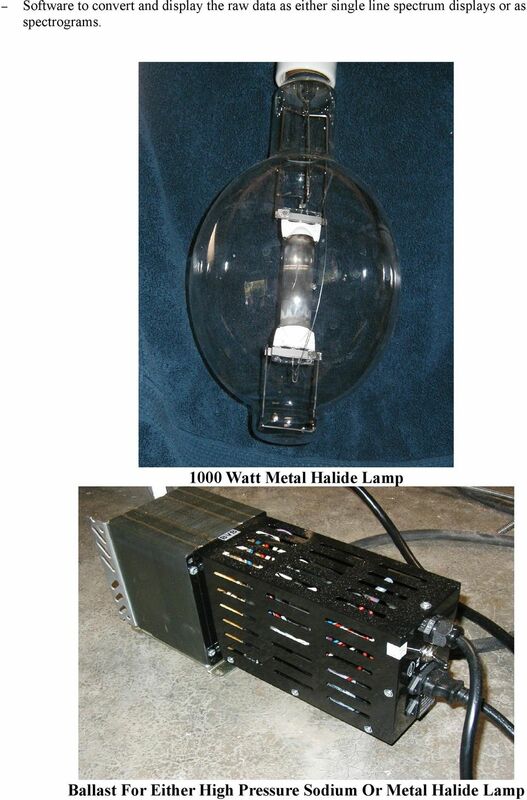 There are no obvious signals generated by the HPS or MH lamps. 11 0 to 200MHz: Dipole (T2FD) with a centre frequency of 100MHz and a 20MHz/div scale With this scan, we see the FM broadcast signals in the middle of the screen, and some intermittent VHF land mobile signals in the top half of the screen. There does not seem to be any appearance of signals as the lamp states are cycled. 12 0 to 10MHz: Dipole (T2FD) with a centre frequency of 5MHz and a 1MHz/div scale This collection of readings had some interesting points. The signals around the first division are AM broadcast band stations. There does appear to be an increase in noise around the 1.5 to 3MHz range when the HPS lamp is turned on and an increase in noise from 2MHz to 4MHz when the MH lamp is active. There is also a very noticeable band of noise indicated at the startup of the MH lamp that extends from 2Mhz to above 7MHz. Notice some frequency drift. These artifacts were the result of the spectrum analyzer being powered from the same electrical plug as the lamps. Moving the supply to a separate circuit cleaned up the visible noise and drift problems. 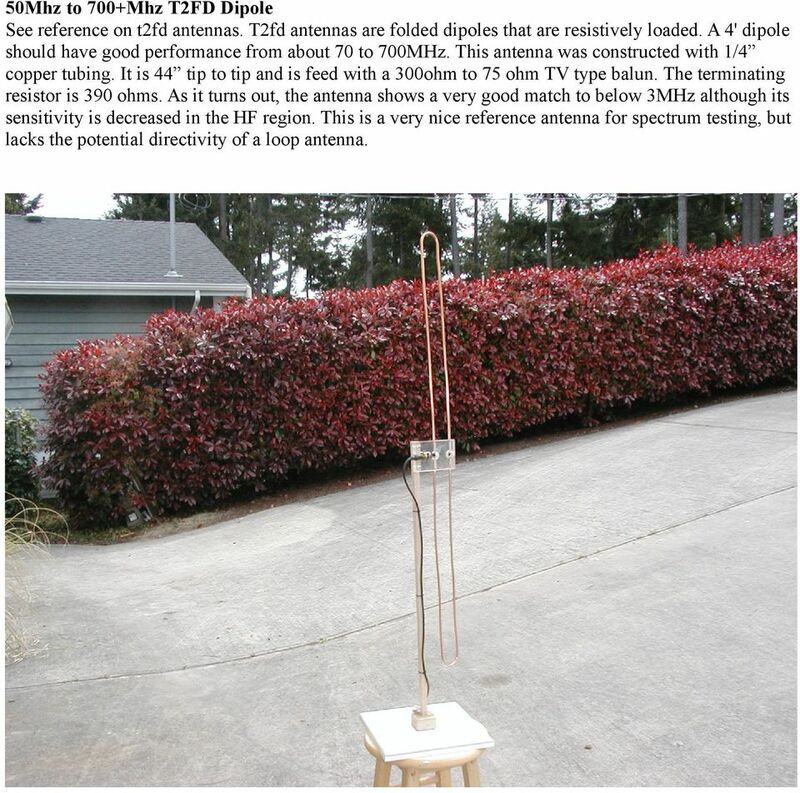 13 1.75Mhz to 3.75MHz: Dipole (T2FD) with a centre frequency of 2.75MHz and a 0.2MHz/div scale In an attempt to detect noise directly radiated from the lamps, the dipole was located between the two bulbs (about 75cm from each lamp). This part of the RF spectrum does not have many signals visible. The individual scans show a slight hump in the noise at around 2.75MHz to 3MHz. This also shows on the spectrogram and has the surprising characteristic of a turning on and off at a regular rate that is independent of the lamp states. I do not know what this signal is, but it is a broadband signal about 250KHz wide. 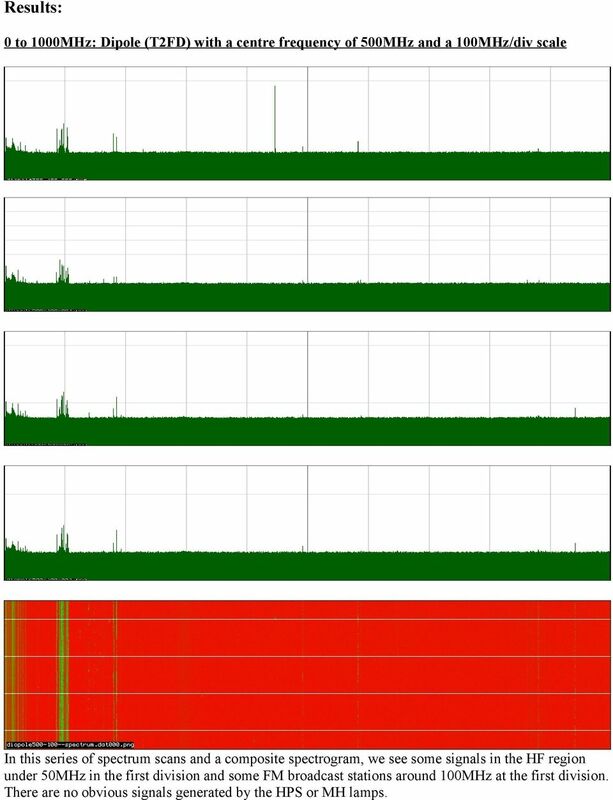 Perhaps a spread spectrum signal from the local navy base. 14 0Mhz to 10MHz: 5 Turn loop with a centre frequency of 5MHz and a 1MHz/div scale This scan has similar features to the previous 0-10MHz scan. Some noise is apparent while the lamps are on and this has been verified to be the result of interference with the spectrum analyzer while plugged into the same A/C supply as the MH bulb. The signals on the low end around 1MHz are AM broadcast band signals. 15 0Mhz to 10MHz: 24 Turn loop with a centre frequency of 5MHz and a 1MHz/div scale This antenna shows good sensitivity across the frequency range. There are hints of noise from 1.5mhz to 7+MHz when the lamps are on, but these were the result of the analyzer being powered from the MH lamp A/C plug. 16 0Mhz to 5MHz: 24 Turn loop with a centre frequency of 2.5MHz and a 0.5MHz/div scale This scan zooms in on the 0-5MHz range in an attempt to characterize the noise seen while the lamps are energized. The AM broadcast band signals are quite strong and there is the wide band signal around 2.5 to 3MHz. This scan is also contaminated with noise by running the analyzer from the MH A/C supply. It is included to help future investigators from misinterpreting results they may see. 17 1.75Mhz to 3.75MHz: 24 Turn loop with a centre frequency of 2.75MHz and a 0.2MHz/div scale This scan covers the area of suspected lamp interference from 1.75MHz to 3.75MHz. This scan was performed with the HP 141T powered from a separate circuit from either of the lamp supplies. There are several signals present including the wide band signal at 2.8-3MHZ. There does not appear to be any indication of lamp related noise. 18 1.75Mhz to 3.75MHz: Scan with a dummy load with a centre frequency of 2.75MHz and a 0.2MHz/div scale This scan was performed with the input of the spectrum analyzer terminated with a 50 ohm load. 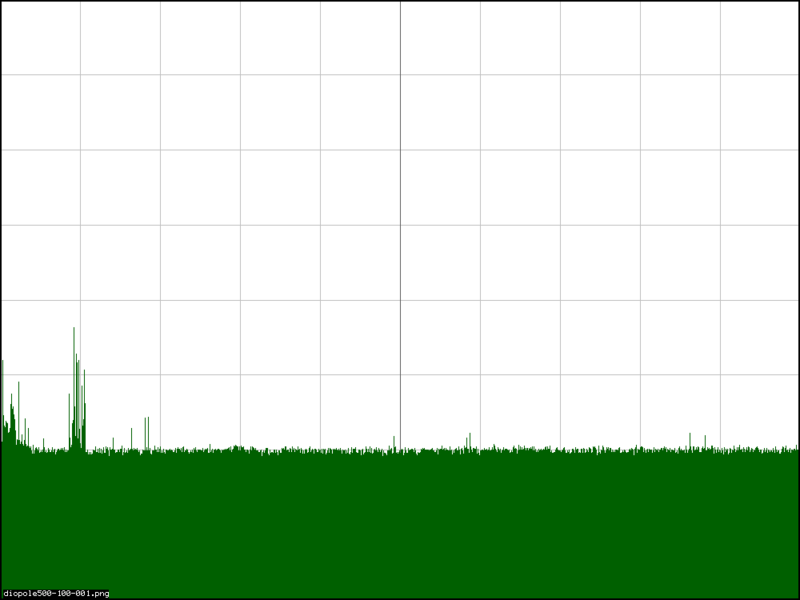 The issues with line generated interference was tested to make sure that the scan was free of artifacts. The HP141T was powered from a separate A/C circuit from either of the lamps. The scan is clean as is expected. 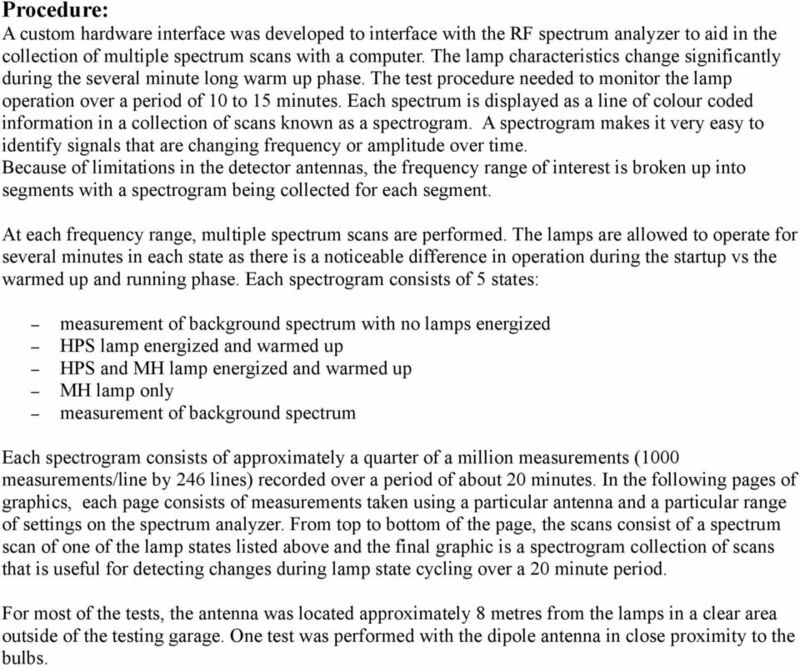 19 Conclusion: Segments of the RF spectrum were scanned for signals that could be related to the on/off cycling of both a 1 kilowatt high pressure sodium as well as a 1 kilowatt metal halide lamp. Within the parameters of the tests performed, there does not seem to be an exploitable characteristic that can be used to identify the operation of the lamps using radio equipment in the 0.1MHz to 1000MHz range. The ballast and igniter circuits have been shown to generate interference that is coupled to the power line. Although no direct radiation was found to be emitted from the 2 types of lamps in the test, these lamps were new with low total hours of operation. Sites operating dozens of these devices with lamps of various ages and conditions have the potential to generate strong interferences. 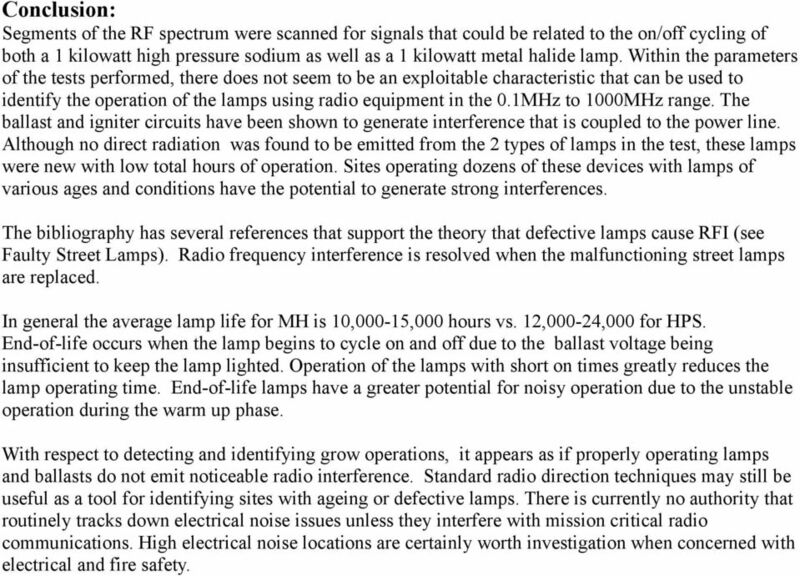 The bibliography has several references that support the theory that defective lamps cause RFI (see Faulty Street Lamps). Radio frequency interference is resolved when the malfunctioning street lamps are replaced. In general the average lamp life for MH is 10,000-15,000 hours vs. 12,000-24,000 for HPS. End-of-life occurs when the lamp begins to cycle on and off due to the ballast voltage being insufficient to keep the lamp lighted. Operation of the lamps with short on times greatly reduces the lamp operating time. End-of-life lamps have a greater potential for noisy operation due to the unstable operation during the warm up phase. With respect to detecting and identifying grow operations, it appears as if properly operating lamps and ballasts do not emit noticeable radio interference. Standard radio direction techniques may still be useful as a tool for identifying sites with ageing or defective lamps. There is currently no authority that routinely tracks down electrical noise issues unless they interfere with mission critical radio communications. High electrical noise locations are certainly worth investigation when concerned with electrical and fire safety. 21 Definition of Terms: HPS high pressure sodium, a type of lamp used for higher power lighting equipment, has a characteristic orange colour Khz an abbreviation for kilo-hertz. A frequency of 1000 cycles/second. MH metal halide, a type of arc lamp used for lighting, has a brilliant white colour Mhz an abreviation for mega-hertz. A frequency of 1,000,000 cycles/second. 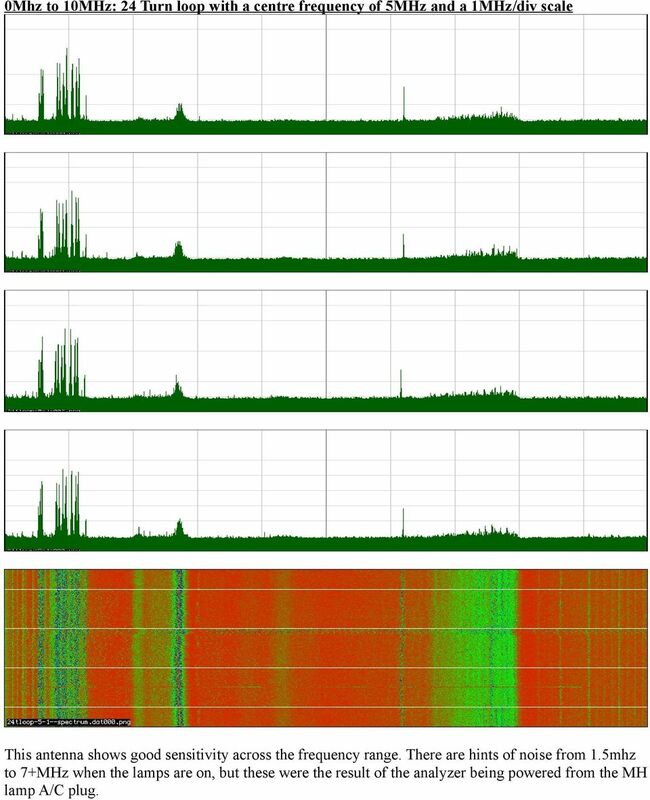 RF radio frequency, an alternating current signal usually at frequencies from 10's of Khz to thousands of MHz SCR silicon controlled rectifier, typically used in motor speed controls and lamp dimmers Spectrogram an image generated by a compilation of spectrum graphs over time. A spectrogram is useful for visually identifying signals that may change over time in both amplitude and/or frequency. SWR Standing Wave Ratio, a measurement used to describe the degree of matching between a transmission line and a load. An SWR of 1:1 is considered matched where as an infinite SWR exists with an open or shorted load. T2FD a type of folded dipole antenna known for performing reasonably well over a broad frequency range. There are at least six ways to go about loading a short vertical monopole. Power Quality For The Digital Age INVERTING SOLAR POWER A N E N V IRONME N TA L P OT E N T I A L S W HI T E PA PER. www.ep2000.com 800.500. Design and Certification of ASH Radio Systems for Japan RFM s second-generation ASH radio hybrids are being used in a wide variety of applications in Japan, operating under the Japanese BIJAKU radio regulations. EE302 Lesson 14: Antennas Loaded antennas /4 antennas are desirable because their impedance is purely resistive. At low frequencies, full /4 antennas are sometime impractical (especially in mobile applications). The Antenna Balun. What is this thing and why do I need it? ANX Application Note Troubleshooting Communications This document is a guide for basic troubleshooting of UPB communication issues. There are two things that can disturb UPB communications: noise and attenuation. Here are the details with pictures of the items for sale as listed below. Please Scroll Down. Security : Forensic Signal Analysis: MPHIL ACS 2009 Security : Forensic Signal Analysis Video eavesdropping- RF Y.K. Roland Tai 1. Introduction 2. History of TEMPEST 3. Type of RF leakages 4. Counter-measures. AUGUST 1993 IC002, IC018A IC019A, IC033 IC069A, IC070A IC071A Coax Twisted Pair Balun Coax Twisted Pair Balun w/cable Mini Coax Twisted Pair Balun CUSTOMER SUPPORT INFORMATION Order toll-free in the U.S.